Continuation from the previous 69 parts, the whole series can be found at http://www.nikoport.com/columnstore/. This blog post is the continuation from the previous one, where I have described the Operational Analytics for Rowstore. I have tried to create a filtered index, but the performance results that I was getting overall were very far from what I have expected from them. After great comments from Vassals Papadimos (MS), I have decided to dedicate this blogpost to the investigation of making the Filtered Indexes work. 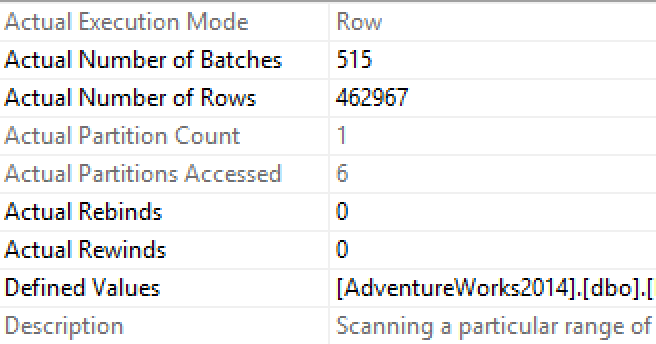 For that purpose I shall use the free AdvenuterWorks database that was expanded with a script from Adam Machanic – Make Big Adventure to have a 250 Million rows Columnstore table. As the previous blog post, I will be running all the tests on the Azure SQLDatabase P6 instance. Now its the time to execute our test query, that includes a search predicate that is different to the predicate that I have used for the filtered Columnstore index. In the query I am using 1st of January of 2012 as the start date for the search, while my Index is set to filter the Transactions with the date before 1st of January of 2011. This query takes some time to execute (well, processing 250 million rows is not a very small table) - with almost 39 seconds of the total execution time, we are also counting with spending over 145 seconds of the so precious CPU time. All you can see is the B-Tree scan, which is definitely what is killing the query performance. We urgently need to find solutions for this problem. As Vassilis Papadimos pointed out in the comments to my previous blog post, there are a couple of ways to address this problem. Let's consider all of them. In the terms of the raw performance, my query took over 75 seconds of CPU time and overall duration was a little bit over 21 seconds. You can clearly see that the data from the filtered Nonclustered Columnstore Index is being concatenated with the data from the B-Tree Clustered Index Scan, which is making this operation extremely expensive. The practical improvement is huge - we are talking around 50% of the overall spent time and cpu resources. that will take over the HOT (actively updated) data. This time the query was executed even faster with just 37 seconds of CPU time and just a bit over 10 seconds of overall execution time. CPU time = 37595 ms, elapsed time = 10305 ms.
Another way that was suggested is to use partitioning on the Clustered B-Tree Index, that would help the overall performance. Since Azure SQLDatabase does not support traditional SQL Server partitioning, I will test this methodology on the SQL Server 2016 CTP 2.4. In my [dbo]. [bigTransactionHistory] table on this VM, I have just a bit over 31 Million rows, but its not the exact performance that I am looking forward to measure, but the execution plan behaviour is what really matters to me in this case. The execution time for the query was 3.3 seconds, while the CPU time spent was about 4.5 seconds. Note: do not compare this execution times with the times on Azure SQLDatabase, since the original tables are absolutely different - 250 Million Rows on my Azure SQLDatabase example, while only 32 Millions at the local VM on my computer. Once again we have a concatenation between the Nonclustered Columnstore Index and our partitioned Clustered Rowstore B-Tree Index. Let's check how many partitions were actually accessed while we were reading the data from the Clustered Index - as you can see on the picture showing the properties we are accessing only 1 partition, which will allow to us to gain some of the performance, if we partition our data well and place different data files on the different drives or LUNs. Of course we can and should consider adding the Filtered Nonclustered Index that is covering the HOT data area that is not being covered by the Filtered Columnstore Index. Very nice improvements for the Filtered Columnstore Index - I really love them. Let's hope that there will be enough documentation explaining the usage with the examples, otherwise people like me might think that the functionality is not really complete. Note that you will need to be extremely careful of where you are setting your filter for Columnstore Index, for example in the last solution should we run the following query with a predicate that is further away from the Nonclustered Columnstore predicate, then the performance will suffer greatly - changing from 3.3 seconds to over 13 seconds. CPU time = 10328 ms,  elapsed time = 13084 ms.
That is definitely something that you will want to avoid seeing in the production environments.